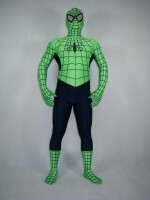 Green Spiderman Costumes on sale.stretchy,comfortable and cheap price. 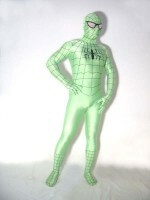 Spidrerman costume suit outfit zentai spiderman,with green and black color. spider line is also black.eyes made with corespun ,can see out well.there has no spider on the back.zipper is on the back. Color: Green & Black Pattern: Yes Fabric: Lycra/spandex Surface: Matte Eye..
Green lycra spandex unisex spiderman costume suit outfit zentai with black stripe,full body design .this is the old style spiderman the stripe on the waist are expand to two side.only the front has the spider.this is a design follow the spider man classic style. Color: green & black Pat..